Warranty: PDS-5001- 1 Year Parts and Labor. PDS-5002- 3 Years Parts and Labor except the plasma screen element, which is 1 Year Parts and Labor. Copyright © 2004 PlasmaTVBuyingGuide.com. All Rights Reserved. Difference Between Units: Nothing except the above differences and the class rating, which is broadcast/commercial for the PDS-5001 and consumer for the PDS-5002. Only other difference is BNC style connection input jacks on the PDS-5001 and the inferior RCA style inputs on the PDS-5002. Test Equipment: Pioneer DV37 Progressive scan DVD player, digital satellite run through Panasonic TU-HDS20 HDTV decoder/satellite receiver, Toshiba W412 VCR, Pluge pattern and calibration testing with Video Essentials DVD, IBM PC. Viewing video presentation equipment side-by-side using the same pure video sources (without looping the signal) is the only way to truly test and grade these technologically advanced TV/Monitor displays. Internal interpolation, conversion, and scaling all affect the way the naked eye perceives the image quality presented - regardless of the native pixel resolution. Several sources must be used with varying signal resolution. Fujitsu was one of the first companies to enter the plasma display market in the U.S. and Canada. They have really promoted the perception of first entry status and attempted to capitalize that idea into market share. And to some extent the strategy seems to be working. They are moving product from their myriad of model numbers, primarily through small profit hungry specialized AV retailers. I will explain this in detail later in the review. The two model numbers listed above are new offerings from Fujitsu. They do not have a predecessor, but will compare very closely with the new 42" offerings as they use the same scalar/converters. Interestingly, Fujitsu is buying and incorporating the Panasonic plasma display element (i.e. glass) for these units. The company does not own manufacturing for 50" glass. Why build a 1 billion dollar plant when you can OEM the product from a proven performer? How does their new slate of plasma display offerings stack up against the competition? Let's unravel one of the most enigmatic brands in the Plasma Display industry. Image quality from video sources such as DVD players, HDTV receivers, digital cable or satellite, and even VCR's render the primary concerns for testing picture quality. We use at least three different sources for testing, since plasma display images can vary greatly between signal sources. The picture on the models is exactly the same so there is no reason to differentiate for review purposes or otherwise. The PDS 5001/5002 like most current offerings, displayed incredible color brilliance and brightness. The factory settings on the unit are set very bright which will drive the unit hard and cause burn in or fading quicker than some of its counterparts. In our dark test room facility I found it necessary to decreased contrast to -15 and brightness to -5 on the unit to optimize it's performance and bring it closer to the operating level of the Pioneer PDP503CMX. There was less false contouring (effectively blending dard gray and blacks) when modifying the factory settings. Compared to other units tested I felt the Fujitsu offering displayed more pixelation (a pulsating visual artifact effect). Indeed, I will be the first to challenge the internal AVM (advanced digital video signal processor) which Fujitsu claims, "eliminates motion artifacts and flicker, improves vertical resolution and reproduces natural movement with ease." Despite its brightness, the units attempt to blend the color information presented - left me believing Fujitsu has some ways to go technologically with their scalar/processor and internal video card circuitry. Aside from the motion artifacts bringing some distraction there was a good bit of graininess and lack of definition. This appeared to be caused by light leakage from the pixel structure. To evidence this, when viewing dark scenes in 480p from the DVD All The Pretty Horses, I could see purple shadowing around the edges of black images. Distance will certainly make a difference with this unit's perceived performance. From 12 feet or closer the PDS 5001/5002 may show too many motion artifacts for the videophile. If used for public display or home theater from 20 feet the eye will not pick up the visual pixelation. Distance really matters with this 50" product offering. Another problem the unit has is up-conversion of low-end video signals (250i to 480i satellite, cable or VCR) to its native pixel resolution. The unit's graininess is increased quite dramatically with these signals. It clearly prefers (as do all plasma displays) an HDTV signal. Nevertheless, Fujitsu should spend more time with the internal scaling and interpolating circuitry to upgrade images from poorer signal sources, which continue to represent 95% of today's programming. Even the most inept manufacturer can show a fantastic picture with an HDTV 1080i signal, and the Fujitsu plasmas are no exception. The three dimensional effect of images in 1080i mode is just stunning on the PDS 5001/5002. The high brightness levels bring a depth and vibrancy to the picture to the point where blemishes on performer's faces become apparent. The problem is… when viewing this unit in retail locations, this is likely the only signal a consumer will see displayed - HDTV or progressive scan DVD. But it takes some adept technology to upgrade the aforementioned low-end signals well. Connectivity choices for Fujitsu's offerings are fairly standard for today with video signal inputs for s-video, composite, and component. Computer signal inputs are RGBHV, VGA, and a DVI-D interface. The PDS 5001/5002 uses internal fans for cooling. They are both audible and noticeable before turning on a sound system. Depending upon the circumstances they could be distracting - in quiet movie scenes, or during a boardroom presentation. This noise is probably the result of the extreme brightness levels the screen is driven to show. The Fujitsu's have excellent adjustment functionality for vertical or horizontal positioning of images. This is a versatile asset for presentation materials from computer sources and can be used in viewing streaming video as well. 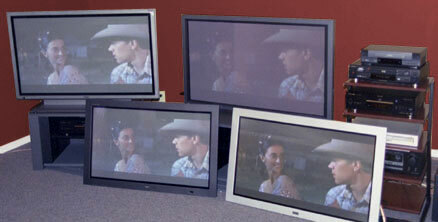 Aspect ratio modes for the plasma are Normal (4:3), Wide 1, Wide 2, Zoom 1, and Zoom 2. The zoom options are extreme and will probably not be used except for presentation. Images appear stretched and lose a great deal of the picture and detail. I found Wide 2 mode to be preferred for DVD and the Wide 1 setting to scale a 4:3 image. The PDS 5001/5002 displays black bars on the left and right of a 4:3 image as opposed to gray bars used on the Pioneer models. With computer input at wide XGA(1280X768) the pixel conversion was accurate and the detail very acceptable even with text. The 5001/5002 did a decent job of up-converting VGA signals but showed some serious "jaggies" when rendering text. Apparently to differentiate its plasma display offerings from its competition and lend a more "top of line" perception to its products Fujitsu has actually raised its prices on its latest round of plasma products. This "Runco-ish" approach may serve it well in retail AV boutiques where it can offer dealers higher margins on its products and thus try to gain exclusivity through limited distribution. As other manufactures are competitively pricing down plasma TVs as the technology becomes more demanded here, Fujitsu - deciding that competition was going to be tough - went the opposite direction. Maybe it will work out for them, but considering the superior Panasonic and Pioneer product offerings are now priced in the $8,000 to $9,500 neighborhood, I'm not sure who will pay for the $15,000 MSRP Fujitsu. Copyright © 2002 PlasmaTVBuyingGuide.com All Rights Reserved.